Valencia at Rosemary Place is a 30-unit townhouse development which has quickly established a market presence in the revitalized Rosemary District north of central downtown Sarasota. This property is located on the block of Cocoanut Avenue bordered south and north respectively by Boulevard of the Arts and May Lane. It also lies just adjacent east of the high-rise Renaissance offering selections of pre-owned Sarasota condos for sale. 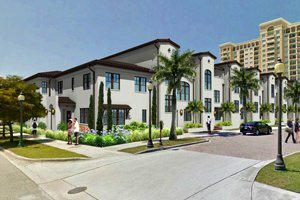 The developer of the Valencia townhomes is ICON Residential, a Tampa-based real estate concern which is also behind the similar Artisan on Main condo apartment project in east downtown. Valencia’s 12-unit phase one, which sits off Boulevard of the Arts, was quickly pre-sold. ICON promptly broke ground in late 2016 its Rosemary project’s second phase for six units in a two-story building facing May Lane. Phase three of Valencia has also been set, programmed for 12 units in a three-story building like the sold-out first phase. The residential apartment buildings of Valencia at Rosemary Place exude the elegance of the Spanish architectural style. This property’s townhouses offers a selection of eight unique designs featuring living areas measuring from 1,900 square feet up to 2,500 square feet. Typically, these condos feature three bedrooms and three baths. Pricing of these residences range from the $500s up to the $700s. Valencia’s 30 townhomes have open floor plans integrating living rooms, dining areas and kitchens. Such a setup enables better integration and social interaction of household members and guests. It also creates the illusion of larger living space and allows more natural light, amongst other advantages. The Valencia residences likewise excite prospective buyers with their private courtyards commonly found only in high-end Sarasota condos for sale. Style and comfort are captured too in the Valencia townhomes with their concrete block insulated construction, European-inspired cabinetry, soaring 10-foot ceilings, and premium electrical fixtures and plumbing. As an added delight for buyers, they can select from an eclectic collection of designer finish packages which can suit even the most sophisticated tastes. 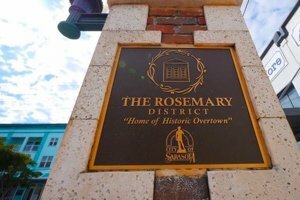 The same sophistication now prevails in the whole of Rosemary District which in recent years has evolved as a Sarasota center for designers and creative talents. The district is now home to some 20 enterprises engaged in such endeavors as home construction and remodeling, architectural and interior design, as well as structural engineering. Together, these businesses have banded into an alliance called the Sarasota Design District and now one of the prime movers for the revitalization of the Rosemary neighborhood. Valencia is thus within arms’ length of an active urban environment, given its proximity not only to potential sources of jobs and business opportunities. This community is also walking distance to many of Rosemary’s revitalized shops and restaurants, as well as the local hubs of culture and the arts. Other complementary elements are already in place to further bolster a live–work–play lifestyle for the residents of Valencia townhouses. City plans are afoot to improve Rosemary District’s connectivity to the downtown via pedestrian-friendly projects for Fruitville Road just a few blocks south of the Valencia property. 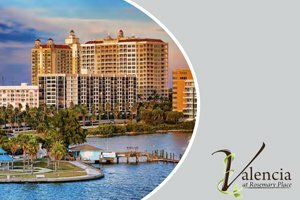 Below are the current real estate listings available at Valencia at Rosemary Place.